© Boris Luzija | Boris cutting the chains applied by bike thieves to his stolen bike, after it had been recovered for a second time. Boris Luzija’s dream bike was stolen in front of his eyes, used in acid attack robberies and then stolen again after it had been recovered. It is a tale of motorcycle theft that is a warning for the motorcycle community and the industries that are supposed to serve it. 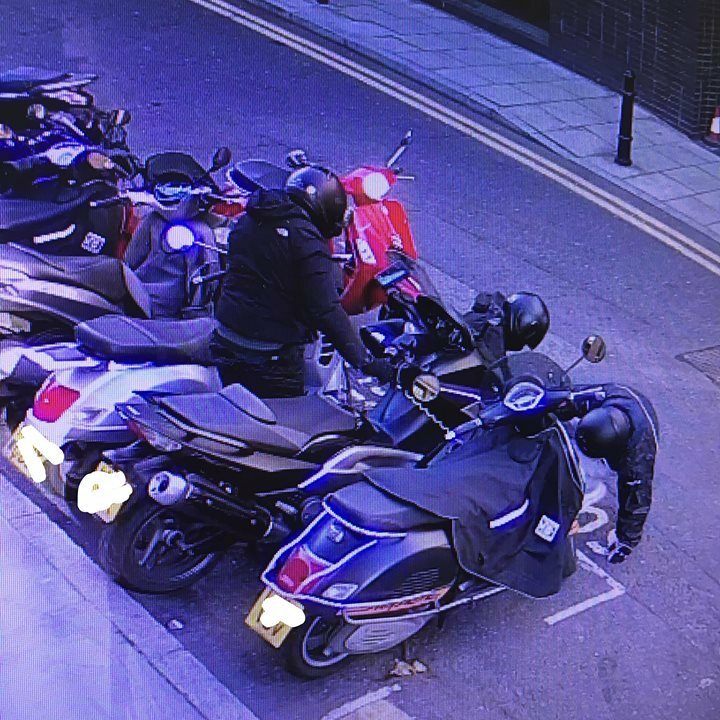 A recent story on the UK Motorcycle Theft Protest Facebook Page highlights how desperate the UK’s motorbike crime situation has become. Boris Luzija moved to the UK from the US last October, and as soon as he could he bought a Yamaha TMAX to commute to work in Central London. 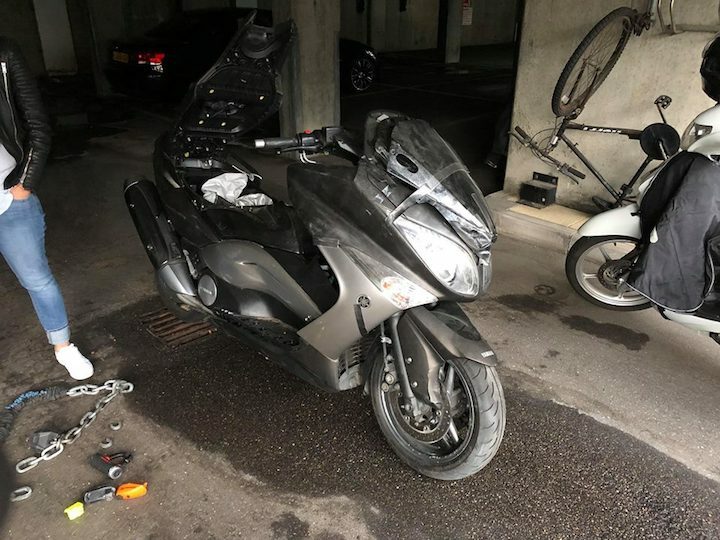 What Boris didn’t know at the time is that the TMAX, with its torquey 530cc engine, lightweight chassis, agile handling and automatic gears is the vehicle of choice for motorcycle criminals. 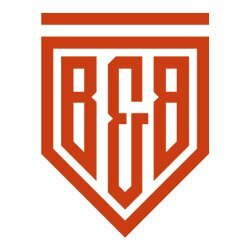 The bikes are favoured by both motorcycle thieves, who use the bike to push along a stolen motorbike, and by armed criminals who rob high street retail outlets, including jewellers and banks, and use the high-powered bike as the perfect getaway vehicle through busy traffic. Boris had only had the bike two weeks before he used it to commute to his first day at work. 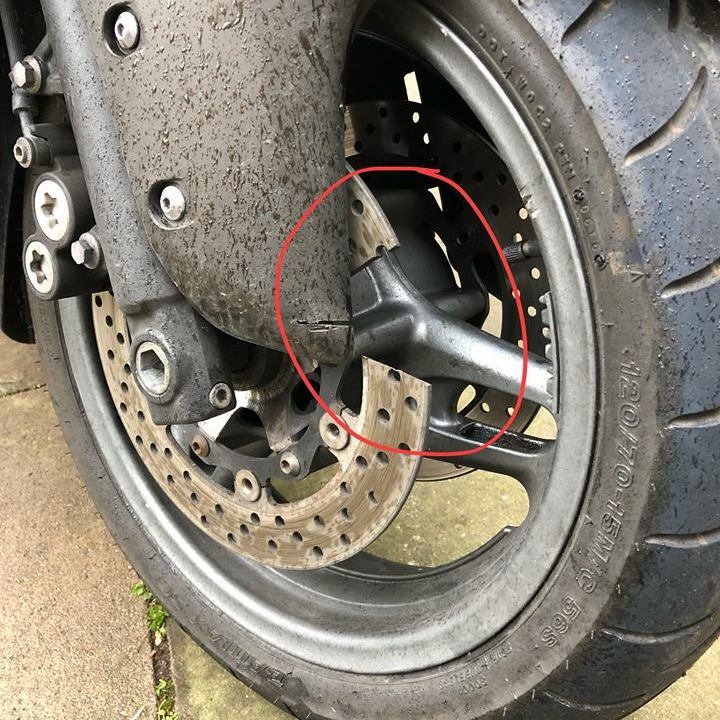 There, in front of his eyes, three men on two scooters used an angle grinder to cut through his front disc, working around the disc lock Boris had fitted. © Boris Luzija | Three men steal the TMAX as Boris watched. To make matters worse, because of the high cost of insuring a bike like a TMAX in London, Boris only had third-party insurance cover. 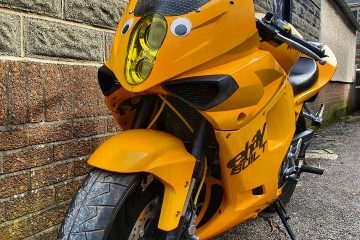 As the bike had no tracker fitted, he was facing a complete loss. A few months after losing his TMAX, Boris got a call from police. His bike had been used by two muggers who attacked their victims with acid. Aside from that and the cut disc, the bike was in reasonably good shape. 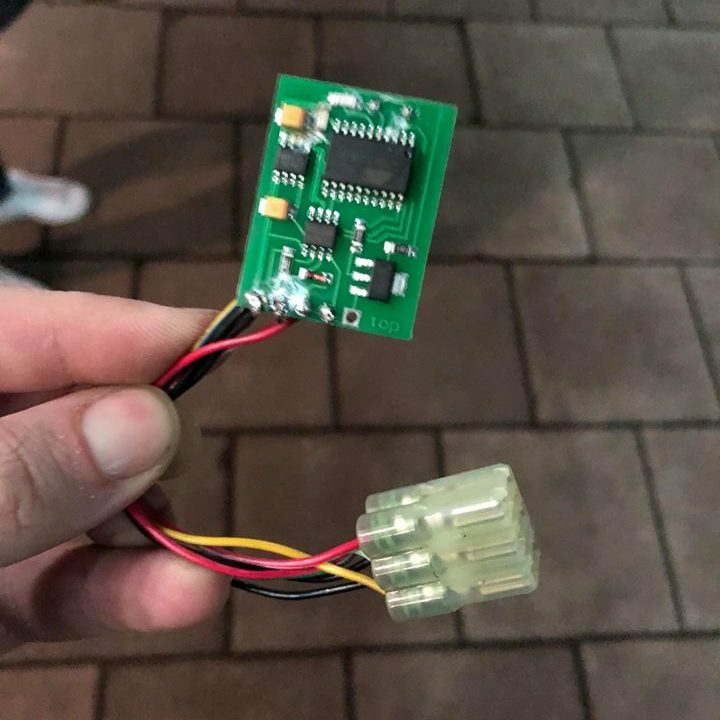 The thieves had cut the ignition to fit an emulator that would fool the bike into thinking the bike’s coded key was still in use. This bypasses the immobiliser and means the thieves had free use of the bike. © Boris Luzija | As the bike was seized during an arrest it still had the emulator in place. After a spell where he had to park his bike on the street, Boris moved into a building with a locked underground garage. Even with that protection, he was mindful that he didn’t want his bike stolen for a second time. So he also chained his bike to his girlfriend’s scooter. Not even a week after he moved in, two men came into the garage, opening the door with their own set of keys. 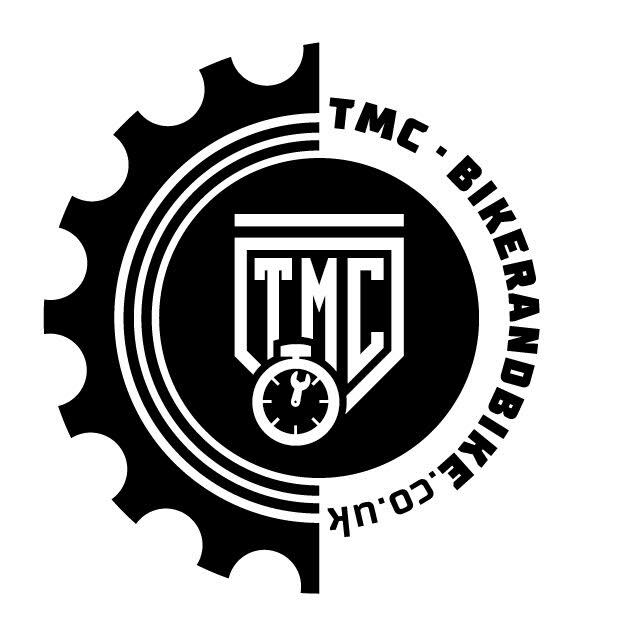 Boris said, “They unscrewed the whole wheel of my other bike so they could put TMAX in the van. 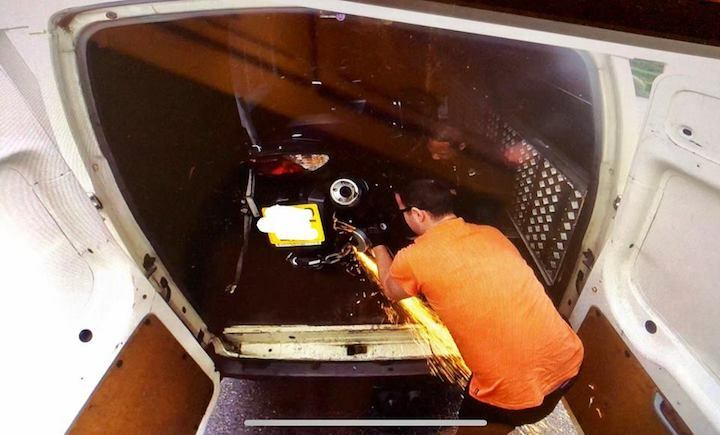 It took them one hour to do that – I saw it on CCTV.” Their white van’s number plates were covered, making the thieves untraceable. He was gutted. The first theft had been bad enough, but now the bike used by his girlfriend had also been damaged. Neither was able to ride to work anymore. © Boris Luzija | The TMAX back in Boris’ garage after the second recovery by police. Believe it or not, Boris was lucky. He got his bike back, twice, whereas plenty of other owners are entirely let down by an under-resourced criminal justice system that sees only one-in-ten stolen bikes recovered. His story is a warning. Unless we see radical change, motorcycling is in danger. The insurance industry is now so heavily weighted against the biker that for many people it is impossible to get the cover they need, despite it being a legal requirement. This is a very real problem in London and it is starting to spread to the whole of the Home Counties and other large cities. 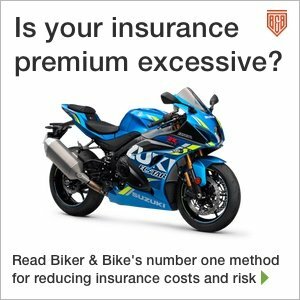 If it continues, the insurance situation could mean only a very few, very wealthy people could afford to be bikers, and only in some parts of the country. The police are doing the best they can with extremely limited resources, but it really isn’t enough. 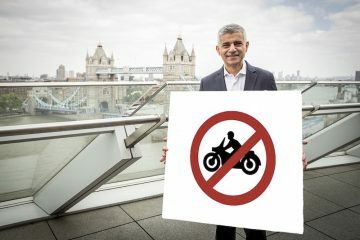 The moped muggings may have decreased, but the theft of motorbikes is still bad and the recovery rates – i.e., solved crimes – are appalling. Police need to prioritise motorcycle crime because the stolen bikes are often used for other crimes. They need to attack the problem at source. We need more dedicated teams patrolling bike theft hotspots like the one Boris’ bike was stolen from. And we need more checks on containers leaving the UK heading for known UK theft destinations such as Lithuania and Poland. The real problem though is bikes are too easy to steal. While Yamaha is making strides to make the TMAX, or at least the DX version, one of the most secure bikes on the market, other manufacturers are lagging far behind. The reasoning that motorcycle theft is a UK-only problem simply isn’t true. 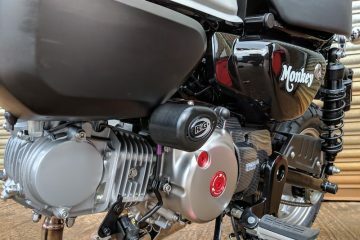 Motorcycle crime is high in other countries, so the excuse that the investment in security is too expensive if it’s just for the UK market is no longer valid. If these industries and the authorities let the current situation continue in the UK, Boris’s story could start to be the norm, not the extreme. Let his be a salutary tale. Read more on how bike manufacturers could do more to reduce motorcycle theft.